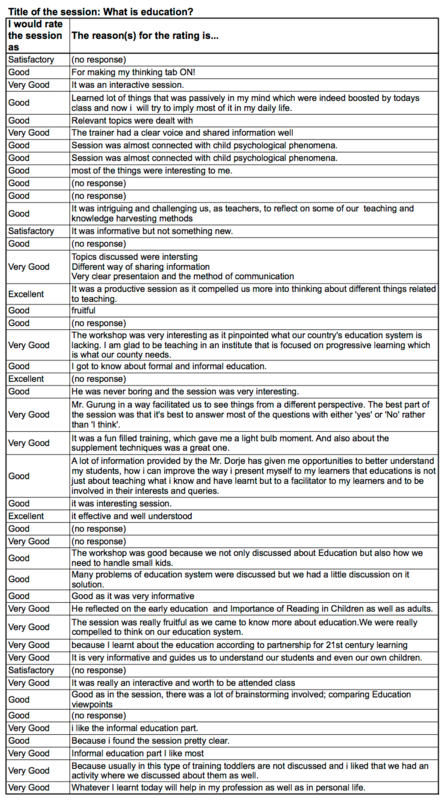 How the two January 25 Professional Development sessions I held at Sanskriti International School were rated by the participants. After about six years of hiatus from teaching, I am back into it again! The difference is that this time I am “teaching” teachers in Nepal instead of international students from around the world outside the country. In addition to teaching critical thinking skills, something I did as a matter of course as teacher of young students, I am also “teaching” my fellow Nepali teachers how to impart them to their students. I started working as a teacher educator a little over a year ago with US Embassy’s Bookbus. I implemented the Everyday Science: Learn, to Teach; Teach, to Learn program for the first time around the beginning of last year. I am back doing the same but at individual schools. I started at Aksharaa School two weeks ago, and at Sanskriti International School (SIS) yesterday! The first day at both schools I had a morning session with all the teachers exploring what formal and informal education is. Exploring informal education, I basically shared what studies have shown makes the most impact on a child’s academic performance, namely, having engaging parents and reading to them, so as to instill a reading habit in them. You can find the content of what I shared in the following two blog posts: IEF 2018: Read to Lead, a reproduction of the presentation I gave about reading at the 2018 Innovation in Education Fair, and Picking Up the Slack: Preparing Children for The 21st Century, a reproduction of parts of the presentation I made to a group of fifty parents or so at Karkhana. Exploring informal education, I also shared how I have been raising my little nephew and what I have learned and discovered in the process. One such discovery I shared was how I got him to stop throwing temper tantrums by talking to him when he started the behavior as a 15-month old baby. Others were about modeling behavior, respecting him, and engaging with him a lot to get him into the habit of engaging with people in a none anti-social way. If the ratings (see image at the top) and the reasons for the ratings (see below) provided by the SIS teachers are anything to go by, most appear to have found the sessions useful. Are you associated with schools that might benefit from my teacher education program? Would your school be interested in a teacher education program? Click here for more details. Get in touch and we can sort out fees, dates, etc. Good on you Dorje! One note of warning from my experience of leading IB workshops though – teachers can be the worst students and the harshest critics. Thanks for that Selwyn. Yes, they can be, can’t they? However, I have been lucky so far — I have not fielded any real harsh criticism…yet. And I think that’s because everything I do with them, they find to be quite new. What I have discovered from my limited experience of running workshops/training for teachers and educators in Nepal has been that most don’t think — or haven’t really thought — much about imparting higher level thinking skills in the science classroom. Finding everything I do with them novel, they are unable to criticize it! That’s what I think is happening anyway!